inscription: Printed at the bottom right: "res_rev@yahoo.com". Poster has black ink printed on white paper. At the top is a dotted photo of figures looking up at signs posted on columns of a building. 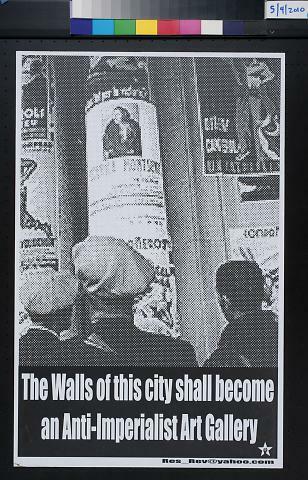 The bottom of the poster has a black background with "The Walls of This City Shall Become / an Anti-Imperialist Art Gallery" in white. At the bottom right is a star with a fist in it.